Are biological organisms like liquid biological machines? What is the app store of the human body? Is evolution moving from natural selection to intelligent design by humans? How gene editing works and what’s the future like for biological computers? How gene manipulation can solve grand human problems or is it a problem in itself? All this and more in this episode of Biohacker’s LIVE Show. 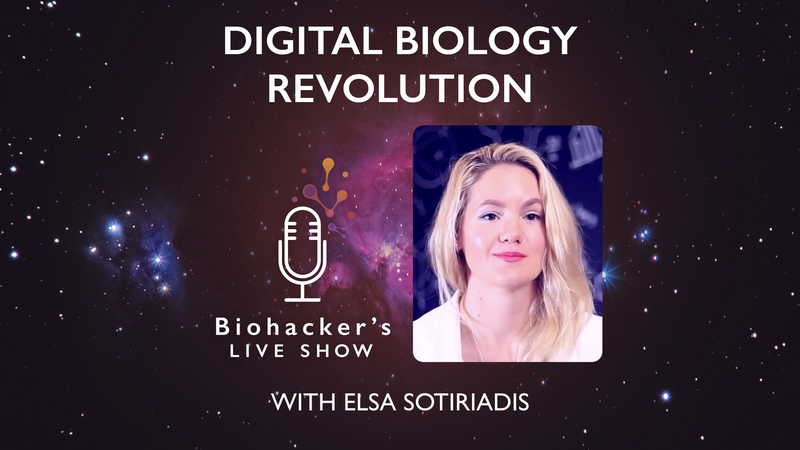 Elsa Sotiriadis is a globetrotting biohacker-turned-futurist and entrepreneur. As director of a VC firm she helped build 25 breakthrough startups to advance innovation in medicine, food, energy and sustainability. Prior to that, she was a lead analyst and management consultant on emerging technologies and co-lead a futurism study. She holds a PhD in Synthetic Biology from Imperial College London, has written for publications like Singularity Hub and tech goes under her skin – she became a ‘cyborg’ live on stage. In her (rare) spare time, she writes science fiction and has published critically acclaimed poetry. Elsa’s pseudonym, E. A. Solaris has written the facinating science fiction book REPLICON: SURVIVAL IS A BUG, NOT A FEATURE (see Amazon here). CRISPR-Cas9 is biotechnology, that enables geneticists and medical researchers to edit parts of the genome by removing, adding or altering sections of the DNA. It is currently the simplest, cheapest, most versatile and precise method of genetic manipulation and is therefore changing the game of gene editing. Transplanting this mechanism into human tumor cell is under massive research in order to reveal new treatments for cancer. Zhen, S. & Li, X. (2017). Oncogenic Human Papillomavirus: Application of CRISPR/Cas9 Therapeutic Strategies for Cervical Cancer. Cell Physiol Biochem. 44(6):2455-2466. doi: 10.1159/000486168. Epub 2017 Dec 18. Review. One example of new potential use for this method is for treatment of cancer caused by viruses. This review article was about the potential to combine CRISPR-Cas9 with other treatment options as therapies for cancer risk related to HPV-infection. The human papilloma viruses (carried by most humans) are associated with more than 90% of cervical cancers, and several other cancers. Screening has reduced both the number and deaths from cervical cancer in the developed world for decades and inoculations has started in order to prevent HPV infections but new therapeutic approaches are urgently needed. HPV produces proteins that shuts down various genes in the human genome that then increases the risk for cancer. Using CRISPR-Cas9 gene editing technique the protein production of those cancer causing viruses can be blocked, ultimately reducing the risk for cancer. These type of treatments are still experimental. It is much easier to modify a cell under the microscope in a petri dish than doing to every single cell in the human body. CRISPR-Cas9 technique however has the potential to achieve just this.